The 1968 Mustang driven by Steve McQueen in the iconic chase scene of the movie "Bullitt" has resurfaced after being locked up in barn for years. SAN FRANCISCO (KGO) -- One of the most famous Hollywood movie cars returned to the city that made it famous today. Movie fans have been fascinated by the green Ford Mustang driven in the iconic car chase of the 1968 movie "Bullitt". It was 13 minutes of spell-binding maneuvers behind the wheel as two cars chased each other through San Francisco's hilly streets. The one driven by McQueen was bought by a Warner Brothers employee. It changed hands several times until Robert and Robbie Kiernans bought it in 1974. It has stayed in that family for 44 years, mostly out of sight. Ford has released a limited-edition Mustang GT for the 50th anniversary of the movie "Bullitt"
"My mom was a third grade Catholic school teacher, and this was her daily driver," said Sean Kiernan, who inherited the car from his father Robert. He says the family also used the car for weekend trips but eventually put it in storage and forgot about it. Few people knew of its whereabouts and movie buffs thought the car had been destroyed. It wasn't until 2001, when Ford came out with a Bullitt commemorative car that Sean and his father decided to restore the car. They worked on it on and off, but it wasn't until Robert died in 2014 that Sean got serious about fixing the car up. But this would not be a typical restoration. "Restoring it to make it look like every other '68 Fastback that had been restored would do it an injustice," said Kiernan. "There's so many dents and scrapes from that movie that it's not a normal '68 Fastback to restore." There are many reminders of the car's Hollywood past. There are holes in the trunk to run cables, and metal bars underneath the vehicle to mount movie cameras. The windshield still has a Warner Brothers sticker from the original owner. The car is now on tour with Ford as the car company promotes a 50th anniversary Mustang GT Premium. It is the same color as the original and has a similar white cue ball for the stick shift. Recently, the tour stopped in San Francisco. 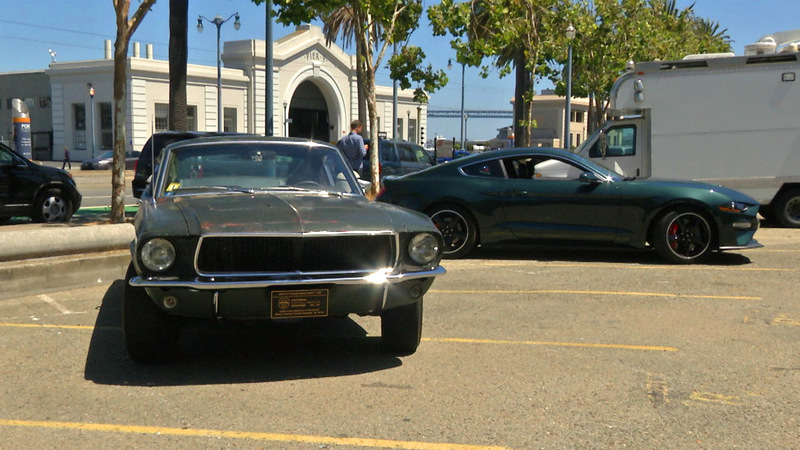 It is believed to be the first time the original Bullitt Mustang has returned to the city since the famous chase scene was shot. "I think the car was a little nervous to be back here because the last time, 50 years ago, it kind of got beat up quite a bit," said Kiernan, who plans to keep the Mustang as a family car.